Control room environmental concept tutorial using Photoshop for basic painting. In this conceptual sketch, what I had in mind is a small one man control room in a secret location underground. Again, keep in mind that this is a really quick concept painting just to get the idea across, not a polished art work by any means. This is week two of me working on my environmental skill. It is still very basic with not much level of detail, just to get the idea onto paper. Well it is not actual paper, but you get the idea. After I do about ten to fifteen of these rough environmental sketches or some people would called it speed paintings. I am sure I can pick a few good ones and take them to the next level. Working this way, you can be sure that you spend your time wisely because polishing conceptual art work or any art work takes a lot longer. You want to make sure that the pieces you decide to polish have potential to be great. That’s the way most concept artists work. Here is a final color concept sketch of a control room. 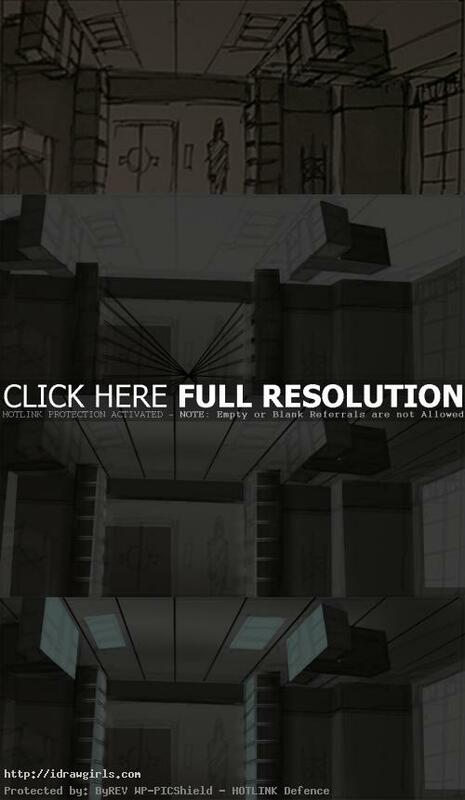 Below are step by step how to create an environmental concept art, control room. First image is the one of the b/w thumbs I pick from my sketchbook. I used ballpoint pen and gray markers then took a picture with my smart phone. Second, I then find or establish the actual vanishing point so that I can line up major objects in the image accurately. But half the time if I can get away with not, then I will. As long as you can make the scene looks correct, then it should be fine. If the perspective looks off, then no. Then you have to pick and choose what part of the image to paint first. I usually finish the big geometry pieces first like wallsx ceilings, windows, etc. Then I will look for the second biggest elements and just work all the way down. Big to small and foreground to background. I will make them on different layers if needed. More tutorials on environmental concept with videos.